The Homey VIP Organic Sofa is a friendly and elegant piece of furniture, due to the 100% organic cotton twill and it's original design. The Sofa is handmade with high quality materials and handcrafted with care. It is a real piece of furniture, upholstered with 100% cotton twill fabric the front wood panels are real Alder wood finished in toffee with chocolate glaze. This Sofa will give your kids a comfortable place to read and rest. Look for the matching chair to create a beautiful mini living room. Your kids will love it. 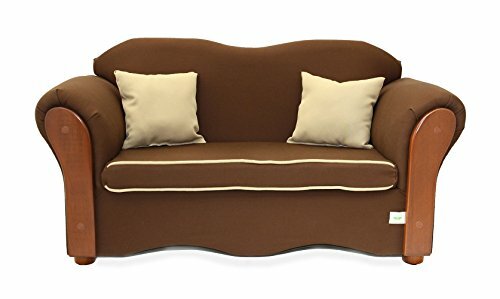 Upholstered with 100% organic cotton twill; Sofa is for kids/toddlers ad not for adults. Front wood panels are real Alder wood finished in toffee with chocolate glaze; Zippered removable seat cover for easy cleaning. Seating area dimensions: 24" x 12"